Historic street grids can handle greater traffic of all kinds—so why aren’t we building more of them? As far as I have been able to determine, no one has ever scientifically compared the capacity of historic street grids with modern road systems. If they did, this comparison is well hidden—which is amazing because the US has invested trillions of dollars on automobile-oriented street networks on the principle that these networks have greater ability to handle motor vehicles. On the contrary, I propose that historic street grids have greater capacity to handle all kinds of traffic, including motor vehicles. This conclusion seems obvious if you think about it. Street grids maximize choice and disperse traffic. Modern road systems minimize choice and concentrate traffic—which means they cease to function at much lower levels of density and activity. I will use my home city, Ithaca, New York, as an example. Ithaca has more than 30,000 people. It is a traditional city, meaning that it was laid out mostly before 1950. It has the highest reported walk-to-work rate in America, at over 40 percent—largely as a result of the city’s compact size, walkability, and the location of the largest employer, Cornell University, within walking distance of much of the city. Eight state highways converge in Ithaca, which has a growing surplus of jobs—highly unusual for struggling Upstate New York. A net of close to 15,000 people commute into Ithaca every day from other counties and cities. Ithaca also attracts many tourists and meetings. It is the geographic, economic, and cultural nexus for a metropolitan area of 105,000 people—almost all of whom come into and go through the city frequently. By modern standards, Ithaca is relatively densely populated at 5,700 people per square mile. That’s 30 percent denser than Portland, Oregon, and 55 percent denser than Houston, the nation’s fourth largest city. Ithaca relies mainly on a street grid that is well over 100 years old and was built for horses, carriages, people on foot, and streetcars. The population of Tompkins County has tripled in the last 100 years, and the number of motor vehicles has skyrocketed in that time. You would think that Ithaca would be congested, but you would be wrong. 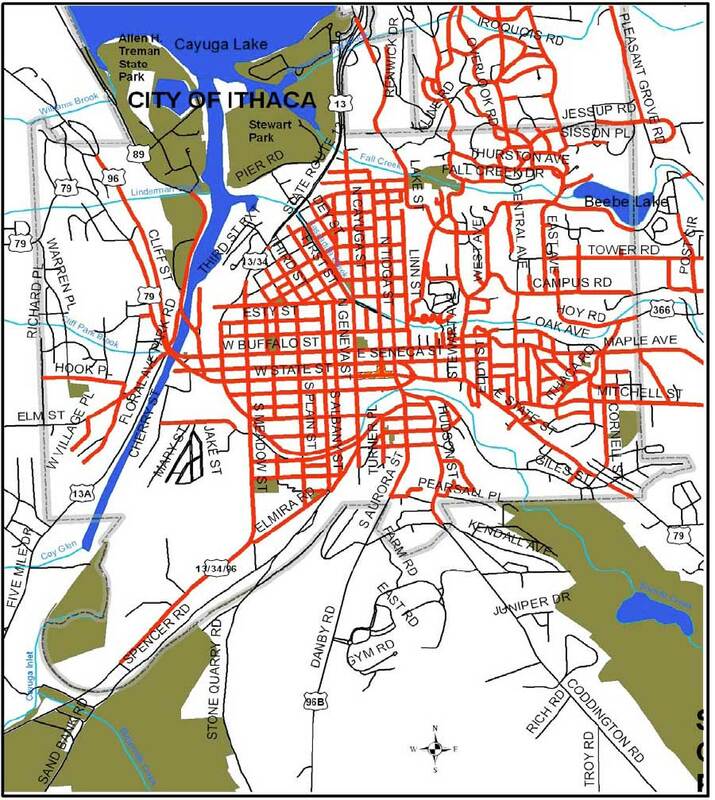 Here’s the most recent map of congested city thoroughfares from the Ithaca-Tompkins County Transportation Council’s long-range plan. Notice how few of the streets are colored yellow (approaching congestion) and red (congested). In Ithaca, “congested” is a relative term. I regularly drive the section of red at the southeast of the map labeled 96B—having traversed it at least a thousand times over 20 years in all times of the day, week, and year. Absent snowstorms, road construction, or special events, I don’t remember any delay of more than a minute or two. I never avoid this section of road, despite the “congested” label, because there is no penalty for driving it any time of day or night. The red section of Route 13, on the west side of town, is congested by Ithaca standards. Locals avoid this section in the late afternoon, although the worst delay is no more than 5 or 10 minutes. 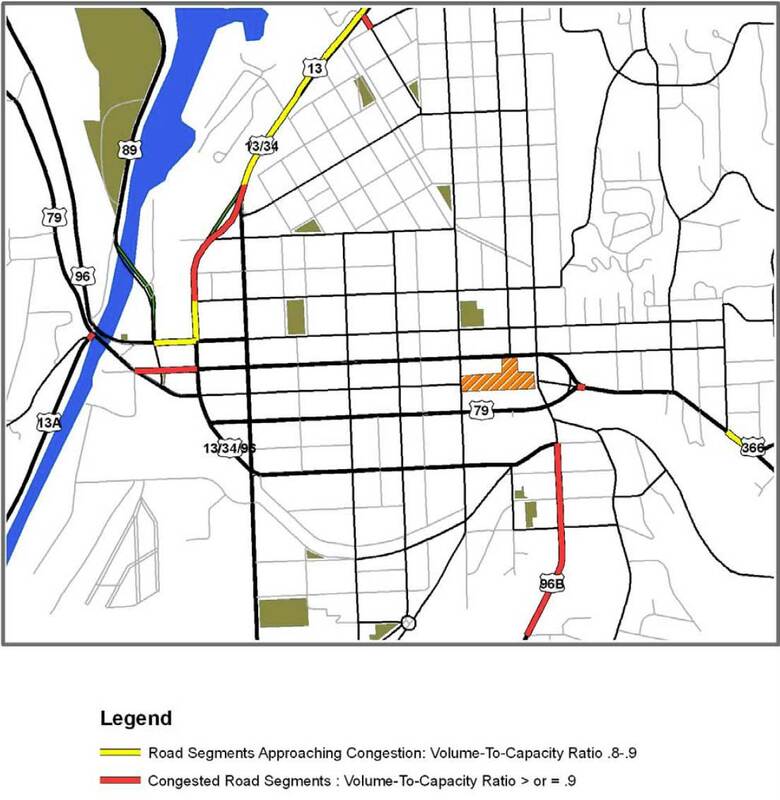 Due to significant water to cross on the west side of town (more than shows up on this map) and limited bridges, the map also shows a small stretch of east-west congestion. That’s it. There is very little congestion in Ithaca and you can drive almost anywhere, at any time of the day, with little or no delay. The congestion that does exist is not due to the street grid, which handles the traffic efficiently. Steep hills and a large lake surround the city on all sides. Crossing the region requires driving through the city, and congestion occurs only at a few geographic pinch points. If Ithaca were laid out like any large, newer suburban municipality, the city would need to be twice as big—maybe bigger—to handle the same amount of traffic and activity. Even spread out, I would expect more congestion than currently exists in Ithaca today. That expectation is based on long experience driving in big suburban municipalities with traffic funneled onto a few large arterial roads with many multiphase traffic lights. In Ithaca, there are many ways to get from point A to point B. If an area is congested, a driver can choose another option for most routes. The grid has other advantages, one of which is walkability. The great majority of the sidewalks in the region are located in the city, and they are well used—as proven by the high walk-to-work rate. People walk for all kinds of purposes. From my block, children can walk to elementary, middle, and high school. About 70 percent of the students at the neighborhood elementary school walk. All of this walking removes traffic from the streets. We also bicycle a lot, despite the hills. Ithaca has a popular new bikeshare system called Limebike. We also have car-share, which only is available in the dense, gridded part of town. Buses are the only mass transit available in the region. Nearly all bus routes are funneled through the city, and two downtown stops account for the lion’s share of boardings regionally. The street grid makes this wide transportation choice possible. Do street grids work equally well in other cities? People often cite Manhattan, with its grid surveyed in 1811, as a paragon of urban congestion. Manhattan is terribly congested, but it also is home to 72,000 people per square mile. One and a half million commuters come onto the island every weekday. And tourists also flock there—Times Square is the most visited place on the planet. If Manhattan were laid out like Irvine, California, it would need to be 20 times as big to handle the same number of residents—and that’s without counting the massive workforce and tourist industry. The Manhattan street grid is congested, but it handles an astonishing amount of traffic of all kinds. Can you imagine Manhattan laid out as modern Irvine on the same geographic area? It would jam up so completely that no one could get in or out, ever. Moses himself could not part the sea of traffic. Up until 1950, every city and town in America employed a street grid for transportation and building development—and as a locus for public life. The grids had different shapes and sizes. Some were rich in squares—Savannah, Georgia, is the prime example. Some employ very small blocks—like Portland, Oregon—and others larger blocks—like Los Angeles. But the grid was standard everywhere. With the new system, street life and sense of community also vanished. About 90 percent of most metro areas are built on this model. The private buildings are excellent, but they lack cohesion and public life. They lack the transportation choice that you find in places like Ithaca and Manhattan. For about 40 years, nobody built anything like a grid. Late in the 20th Century new urbanists built a few street networks that were similar to grids—and most had to fight to get these networks approved. Developers of Mashpee Town Center in Mashpee, Massachusetts, referred to streets as parking lot access lanes to allow their construction. In Portland, the street grid was extended to create the Pearl District despite opposition. For the most part, though, the street grid has vanished and it has not come back. The supposed reason is that “dendritic” street networks—designed like the branching of a tree—work better for automobiles and transportation. The car took over American transportation and we needed new designs for communities that would work better for motor vehicles. The car is a very private mode of transportation, and our modern cities were built for privacy. The speed of the main thoroughfares, designed for traffic moving 40 mph and faster, is not conducive to public life. Dendritic systems concentrate traffic and maximize the need for cars. All of this adds up to systems that become congested at moderate levels of density. After the grids were abandoned, nobody bothered, for more than 50 years, to test whether the newer, disconnected street networks work better. Some answers can be found in two studies conducted of 24 small- to mid-sized California cities in the last 10 years. Twelve of the cities were mostly laid out prior to 1950, and so the dominant pattern is the connected street grid. The other 12 were laid out after 1950, and the dominant pattern is sub-urban with large blocks. Grids therefore are tested side-by-side against dendritic networks. The first study showed that the older cities have less than one-third the traffic deaths per capita as the sub-urban cities. The second study showed that the older street networks correlated to lower rates of obesity, heart disease, diabetes, and other health problems. A new handbook from the Institute of Transportation Engineers—the primary professional organization for street and road designers—shows that best practices are changing. Implementing Context-Sensitive Design on Multimodal Thoroughfares advises engineers on improving the connectivity of street networks, and confirms that dense grids are safer, citing yet another study (Disclosure: I wrote the case studies in the book, although I had nothing to do with writing the other sections). The handbook notes that street grids can reduce congestion, but it does not discuss the capacity of street networks. The lack of research on capacity is a sign that we have not fully faced up to the mistakes that were made in the middle of the 20th Century. Grids are safer for drivers and pedestrians and their capacity to handle multimodal traffic is terrific. That we stopped building them, all at once, without scientific study, is astonishing. So why aren’t we building more street grids, even today, when we have had the better part of a century to learn from our mistakes?